Fixya is a Q&A website that compiles fix-it requests for a variety of items from cars and chainsaws to routers and monitors. 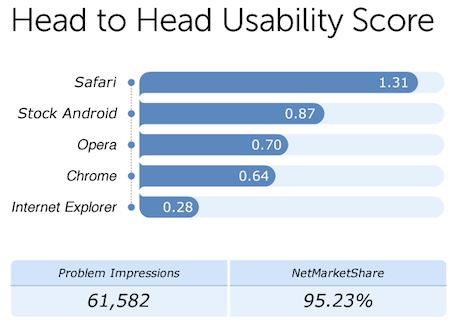 Recently, the site turned its attention to mobile browsers, looking through a total of 61,582 different help requests for the category to determine which browser had the best usability score. The winner? Apple Safari for iOS. The company combined and analyzed data from the problem impressions on its site, mixed it in with market share data from NetMarketShare, and came up with a usability score. 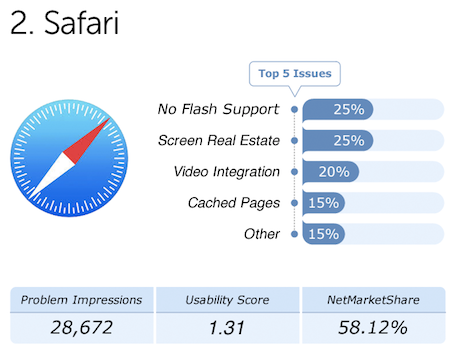 The higher the score, the fewer problem impressions Fixya saw in relation to total market share for a browser. Safari came in at 1.31, with the stock Android browser falling well behind at 0.87, Opera coming in at 0.70, Chrome at 0.64 and Internet Explorer dropping the ball at 0.28. When it came to Safari, most of the so-called issues dealt with the lack of Flash support in the mobile browser, along with the UI. However, it should be noted that most of the numbers were gathered prior to the release of iOS 7, so many of the UI issues (e.g., lack of screen real estate) have been addressed. The full report is available on the Fixya blog, and goes into tremendous detail about the pros and cons of every mobile browser.